One of the best things to improve the feng shui of your environment is to create your own personal paradise. This may be your entire home or it may be one room that you consider just yours, like your bedroom or home office might be just yours because you share your home with others. This space should be one that you walk in that space and just feel great, energized, productive or relaxed depending on your purpose for the space. Think a bit on what would make that space better for you … more color, more organization or maybe something more beautiful to look at that provides the right atmosphere in your space. Creating a place that feels special and inviting to you is the right place. The dictionary defines paradise as: a place of extreme beauty, delight or happiness. Taking this into consideration, what is it in your space that might be hindering the beauty, delight and/or happiness that you desire? This should be a sanctuary. Ideally your whole home would reflect this, but we have roommates, spouses, parents, etc … and their chi gets mixed with ours. Try to get them on board with feng shui but if they choose not to be a part you can still feng shui the common areas to reflect both of you without their help and you can feng shui your own personal space. In either case, feng shui will still work. It is about the intention you put forth when creating this wonderful surroundings. 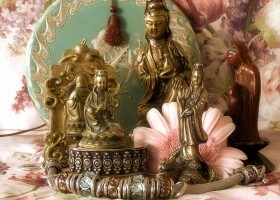 Bringing joy, beauty and intention together to create your own personal feng shui paradise is a labor of love. That will be reflected in your efforts and enhance the feng shui of your environment.